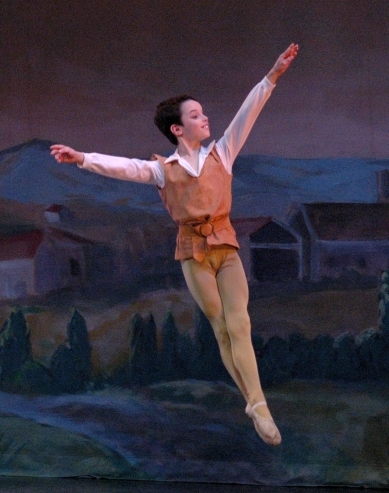 [Jenkintown, Pennsylvania, USA] – — Metropolitan Ballet Company (MBC) will hold auditions for its Boys’ Scholarship Dance Program on Saturday, June 7, 2014 at 9:00 AM, at the studio of Metropolitan Ballet Academy, 700 Cedar Road, Jenkintown, PA 19046. Up to fifteen boys ages 7-11 and 12-18 will be selected to receive a full year of free, weekly dance classes with Alexander Iziliaev, a former principal dancer with Pennsylvania Ballet and Denis Gronostayskiy, a graduate of the world-renowned Bolshoi Ballet Academy. Over fifty boys participated in the MBC program this year. The Boys’ Scholarship Dance Program, celebrating its 16th year in 2014, provides tuition-free training in all-male classes to more than 50 boys, ages 7-18, each year. Boys’ unique movement and learning styles are addressed by distinguished male dancers serving as teachers and role models. The program offers weekly classes in beginning, intermediate and advanced ballet, as well as partnering; and guest instruction in modern, jazz, and character dance. It is designed to enhance athletic skills, flexibility, and strength. Participants in the program also enjoy many diverse performing opportunities. Classes begin in September 2014 and continue through June 2015. No prior dance experience is required. The acclaimed Boys’ Scholarship Dance Program was founded by Lisa Collins Vidnovic in 1999 as a way to make ballet accessible to boys in the greater Philadelphia region. Vidnovic, a former Pennsylvania Ballet soloist and Ballet Mistress, founded Metropolitan Ballet Academy (MBA) in 1996 and Metropolitan Ballet Company (MBC), a nonprofit, pre-professional performing company, in 2001. Over 230 boys have participated in the program since its founding, and some have pursued professional careers in dance. The MBC Boys’ Scholarship Dance Program is proud to be supported by grants from the Loeb Performing Arts Fund of The Philadelphia Foundation, and by many generous gifts from individuals. Metropolitan Ballet Company is a 501(c)(3) nonprofit organization. For more information about auditions for the Boys’ Scholarship Dance Program, MBA classes for boys and girls, tickets to the MBA Showcase May 31- June 1, 2014, or tax-deductible contributions to MBC, please contact Lisa Collins Vidnovic at 215-663-1665 or visit http://www.metropolitanballetcompany.org. [Calgary, Alberta, Canada] – Artistic Director Edmund Stripe is pleased to officially announce the School of Alberta Ballet’s Boys’ Scholarship Program. Designed to attract outstanding international and local talent, the program offers up to 25 full tuition scholarships to talented male dancers ages nine and older. In addition, the School of Alberta Ballet is proud to announce boys preschool classes in Calgary and Edmonton for only $80 per year. 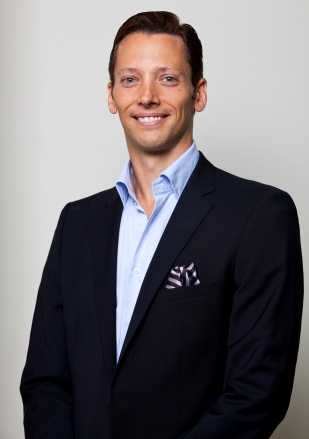 “I am delighted to announce these scholarships to further encourage and assist talented male students to develop and hone their dance and performance skills at the School of Alberta Ballet,” says Edmund Stripe. To be considered for these scholarships, male dancers ages nine and up are invited to audition for the School of Alberta Ballet’s Professional Division. Up to 25 full-tuition scholarships will be awarded each year, giving aspiring dancers the extraordinary opportunity to train full-time and receive their academic education at the official training centre of Alberta Ballet. All aspiring male dancers are encouraged to attend an upcoming audition in Ottawa, (March 29) Toronto, (March 30) Edmonton, (April 6) or Calgary (April 13-14). To engage a new generation of male dancers, the School of Alberta Ballet is delighted to offer preschool boys an opportunity to attend the Open Division for only $80 per year. Boys ages 3-5 can attend classes that will cater to their high energy and learning style while giving them a chance to train with world-class teachers. Registration opens April 1 for returning students and April 15 for new students. Further information can be found at schoolofalbertaballet.com. For over 20 years, the School of Alberta Ballet has been consistently recognized as a world class training facility and charitable organization. 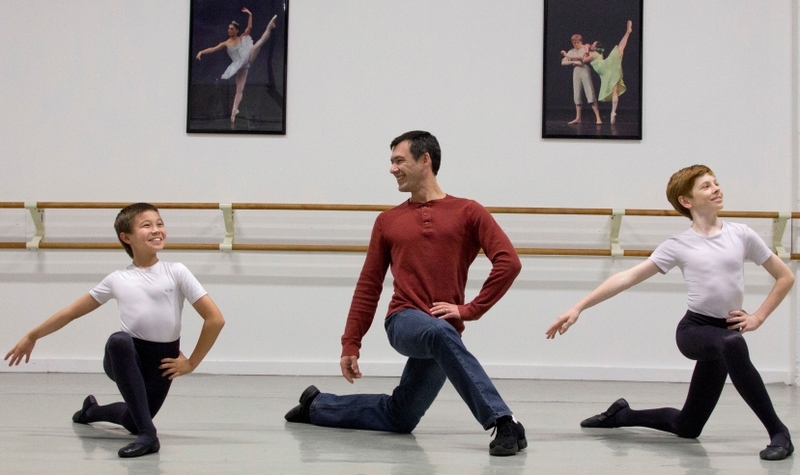 Under the leadership of Artistic Director Edmund Stripe, the School has an annual enrolment of more than 500 students in its Foundation Training Program and Professional Division. The School of Alberta Ballet has an active community profile with free outreach and community programs reaching thousands of children every year. This past spring, CPYB announced a new Male Scholarship Program, which is an expansion upon the Men’s Program currently in place at CPYB. This exciting program, and an outstanding chance of a lifetime I might add, is the first of its kind within a ballet school. I thought it might be interesting for us to take a peek into the program since the announcement was made. For the inside scoop, I interviewed CPYB school principal, Nicholas Ade. Heading to Ballet Academy East (BAE) on Manhattan’s Upper East Side it seems like forty years ago since I first set foot inside the studio of the Maryland Youth Ballet (MYB) in Bethesda, Maryland. That’s likely because it was thirty-nine years ago. Or maybe it actually was forty. The number seems far less important now than the life-changing experiences that followed. Learning to dance profoundly altered my understanding of the world. My world was transformed from the very first lesson. It morphed into an incredibly exquisite geometry of complex angles and swirls, invisible and yet nearly palpable lines of energy stretched off into infinity and all of it was wrapped up in beautiful music. Ballet was incredibly difficult but the more I managed to get right, the more hooked I was. Learning to use your body as an instrument of expression is one of the greatest experiences in the world. I won’t lie: I went for the pretty girls. I stayed for the art. My first class was pas de deux — learning to dance with girls. This turned out to be MYB’s secret reason for wanting me to join up with them: they had an acute shortage of boys to support, lift, toss and catch the girls. Easy? No… this is athleticism of the highest order and was harder than any football or basketball I had ever played before. It was more difficult than I’d had any idea. Many schools still have trouble finding enough boys to help their girls learn partnering and this opens up a great opportunity for any boys thinking of learning to dance. For my first class, I was placed at the barre behind a girl I recognized from my junior high school (I later discovered her name was Susan Jaffe) and I was casually instructed to just follow her. Initially I was bewildered by the French vocabulary that named the steps and floundered while trying to do things with my feet that seemed outlandish, verging on bizarre. Muscles previously unknown to me were put to use doing things I’d never conceived as I vainly tried to copy that girl whose name I did not yet know. She made everything look deceptively easy. Never in all the forty years that followed did I ever feel such all-encompassing pain as I did for two days after that first ballet class. Ballet Academy East is where I have come today to see the auditions for the school. I’m here because BAE wants to attract some attention to its dance classes for boys. This is one of the top schools in New York and the school has valuable scholarships to offer. BAE’s faculty is composed of some of the best teaching talent in New York City and the school regularly has its students hired by the best dance companies in the country. The school’s curriculum is based on the one used at Central Pennsylvania Youth Ballet which has turned out an improbably high number of professional dancers. The list of CPYB alumni is jaw-dropping in its breadth of success. Obviously the curriculum works and that is the model they are replicating at BAE. BAE is run by Associate Artistic Director Darla Hoover and founder Julia Dubno who are equal parts likeably cheerful and deadly serious. The cheerful part is that they cultivate a warm and supportive environment with positive encouragement all along the way. In observing the first level, when students are getting their initial exposure to ballet, I note that Hoover has one lead teacher with two other faculty members to assist plus two advanced students. Every child gets strong individual, literal hands on attention. They hold weekly faculty meetings in which they discuss every single student in the school. Your child will not fall through the cracks here or be ignored just to get your tuition dollars. The serious part is that they are in business to provide top level training for the aspiring professional and their standards are correspondingly high. It is a cohesive micro-community built with a culture of success. In watching Hoover run the auditions I was struck by a few notions. Hoover and all of the other teachers treat the children with dignity and respect. She has been evaluating the potential facility of young children for a long time and she has a clear and economical system for identifying potential and problems. The thorough care with which Hoover and her team evaluate the children verges on something resembling a medical exam. Among the nine year old girls, Hoover quickly identified one girl as having one leg significantly longer than the other and made a note to let the parents know. She explained that she doesn’t want to give anyone false hope nor does she want to miss out on a student who may have potential that has yet to be realized. Ballet is extremely demanding and physical suitability is essential. When the older students filed in for their audition, Hoover put them through their paces in an abbreviated ballet class. She was looking for the things that matter. Timing is crucial in a young dancers training if they are to reach the necessary developmental plateaus to become professional dancers. If certain elements of musculature, body awareness and discipline are not in place by the time a student reaches thirteen or fourteen then Hoover won’t be able to help. Several of the girls clearly have had extensive training but it was equally clear that it was not training of high rigor or quality. They were unable to jump, they had surprisingly little muscle tone and were generally vague about their movements. It is too late to remediate most of them. There were a couple of girls that Hoover felt she could really help with four years of hard work. Among the boys there was one potential future dancer who was inexperienced. When we spoke about him later, Hoover identified his willingness to try things that he’d never seen before and he made fairly good approximations of the steps with solid jumping ability. He was alert, focused and displayed generally good energy and physical coordination. He had an apparent desire to learn and tried his best at everything without getting frustrated. She felt certain she could make a dancer out of him. This was his lucky day. Any boys out there that have thought about going into dance are well advised to take a close look at Ballet Academy East. There is another audition on Monday, September 16 at 5:30pm. Theirs is a nurturing and thriving community of young artists. There are performance opportunities twice a year providing challenging choreography. Young men will get to partner with some of the best young women in the city in an environment that is notable for its lack of friction and competition. Partnering experience is absolutely essential in getting a professional dance job. Where some schools lack depth in male teachers, BAE has plenty of them and the school is turning out great male dancers such as New York City Ballet’s Chase Finlay. Becoming a dancer is one of the most physically challenging things you can do with your body in terms of athleticism. The greater your commitment and the harder you work, the more you are rewarded. You should also know that Darla Hoover is known for motivating dancers with the reward of a cupcake. She claims it worked with Chase Finlay. Here’s what I know: Once you become a dancer you never really stop being a dancer. The discipline becomes part of your mind and body and is inextricable from your experience of the world. You will have a heightened sense of awareness of your body and your relationship to the physical world. That internal sense of balance and economy of movement that dancers develop never completely leaves you. When you become a dancer, your internal yardstick of excellence is forever tied to a physical ideal that is at once inspiring and frustrating. When you see brilliance at that level it becomes a profound experience of a transcendent ideal which combines form with movement. It is simultaneously frustrating because that level of perfection is unachievable for most of us. If, just once in your life, you had been lucky enough to experience what it was like to be able to use your body as an instrument of pure expression you would never want to go back to the way you were. And finally, however hard you may have to work at any other job for the rest of your life, you will always compare it to how hard it was to be a dancer and you will feel relieved that by comparison what you’re doing now isn’t that hard. For young boys who are interested in studying ballet, here’s an opportunity that cannot be missed! Ballet Academy East (BAE), known for training young ballet dancers to become professionals, will hold auditions to offer a full-year scholarship to boys. Auditions will be held on Wednesday, Aug. 28 at 4:45 p.m. and Monday, Sept. 16 at 5:30 p.m. at Ballet Academy East, 1651 Third Ave. Eight, full-year tuition scholarships will be awarded. 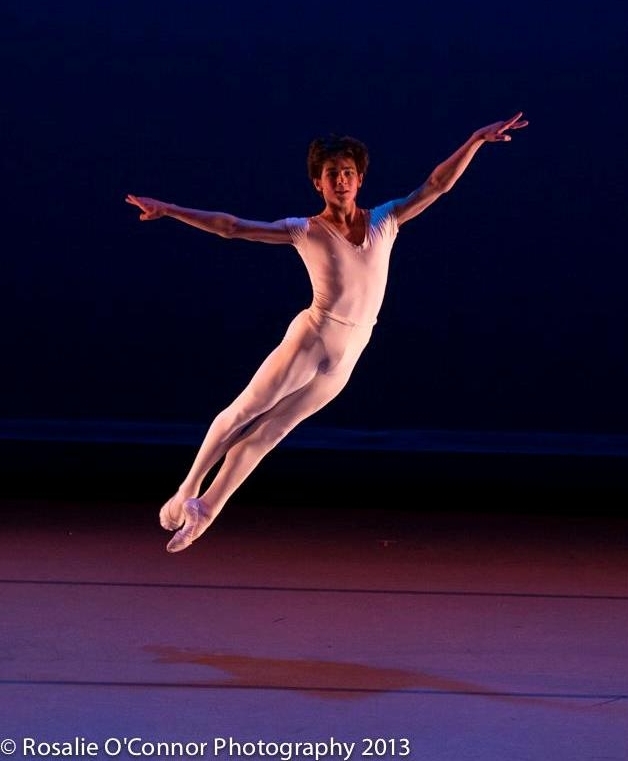 Some alumni include Chase Finlay, New York City Ballet, principal dancer; Ariel Rose, Miami City Ballet; Trevor Felixbrod, Alabama Ballet; Ian Bethany, Ballet Austin; Kendall Britt, Ballet Memphis; Alexander Castillo, soloist; Christopher McDaniel, Los Angeles Ballet; and Devon Carbone, Bavarian State Ballet II, among others. Students of BAE are guided under the tutelage of faculty members that include Hoover, Charles Askegard, Maxim Beloserkovsky, Cynthia Birdwell, Olga Dvorovenko, Peter Frame, Jenna Lavin, Joseph Malbrough, Tara Mora, Francis Patrelle, Elizabeth Walker and Cheryl Yeager. The curriculum includes technique classes, pointe, partnering, variations, stretch, men’s weight training, modern and character. Performing opportunities include two annual productions: the Studio Showing in February and the Spring Performance in May. The director and founder of Ballet Academy East is Julia Dubno. A girls’ auditions will also take place on the same day, but dancers will be separated into groups upon arrival. To apply to attend an audition, visit www.baenyc.com, click on “Pre-Professional Division” and follow the online instructions; call 212-410-9140; or send an email to info@baenyc.com. For more information, visit www.baenyc.com. [Media, Pennsylvania, USA] – The Academy of International Ballet, official school of International Ballet Classique, is pleased to announce a special “one year” TUITION-FREE program for boys ages 7 through 18! This unique program is designed to enhance athletic skills, flexibility and strength. Participation in this special program includes opportunities to perform in our future ballet performances. All students in this special program must audition for possible acceptance. No prior dance experience is required. Boys in this special Vaganova-based training program will build stamina, flexibility, muscle tone and strength, including balance and coordination using exercises and dance movements. According to IBC Artistic Director Denis Gronostayskiy, “Our special one year program for boys is a beneficial activity both mentally and physically. It is a mentally demanding and a physically challenging program. Boys will do much running, jumping and sports-related physical activity in a large studio rather than on a playing field. The student will learn how to correctly hear, move and react to music under pressure, how to cooperate with others; and, most importantly, learn first hand traditional courtly manners and social etiquette. 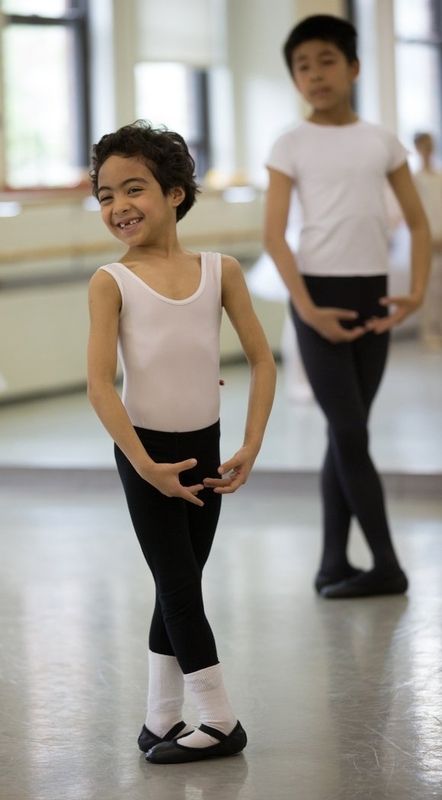 This 10-month program is based on the revered Vaganova Method of teaching ballet to boys. By offering to young men this free experience-enhancing program we provide a skill set platform to launch many different careers one of which is, of course, professional ballet”. All classes are taught in the finest traditions of the Bolshoi, heir to almost 300 years of excellence in ballet. There is no tuition for this program. Commitment to class attendance and rehearsal time is required and adherence to all rules and regulations. All are invited. Open auditions will be held at the Academy of International Ballet located on the upper level of the Granite Run Mall, Suite 209 at 1067 West Baltimore Pike , Media PA 19063. Audition start time is 10:00 a.m., Saturday, August 10th. Please arrive at least 15 minutes before start time. For additional information call 484-444-2389 or 866-908-5666 or e-mail us with your questions at balletacd@comcast.net. [Herndon, Virginia, USA] – Classical Ballet Theatre (CBT) offers full scholarships to boys and young men interested in training under the auspices of the renowned Alisher Saburov. Mr. Saburov — a former Bolshoi Ballet star with high expectations, quiet discipline, and masculine form — has produced very successful male athletes. His young dancers typically earn high placement in the Youth America Grand Prix competition, receive scholarships for summer training with outstanding ballet companies, and portray important roles in CBT’s full-length productions. Those who choose also go on to dance professionally. For example, one alumnus currently is performing with Atlanta Ballet, and another enjoyed careers with San Francisco Ballet, Cincinnati Ballet, and Smuin Ballet before enrolling in Stanford University. At this time, there are openings in the scholarship program for new and current male dancers. For more information, please contact Kim Brummett at (703) 471-0750. CBT is a not-for-profit performing arts organization dedicated to providing education, performance, and outreach opportunities in the art of dance to Northern Virginia and the surrounding communities. For more information about CBT, its classes, or upcoming performances, please visit http://www.cbtnva.org and Facebook. [Miami Beach, Florida, USA] – If you ask someone to name a valuable commodity, they may say gold, or oil. Ask someone in ballet the same question, and there’s good chance they’ll say boys. 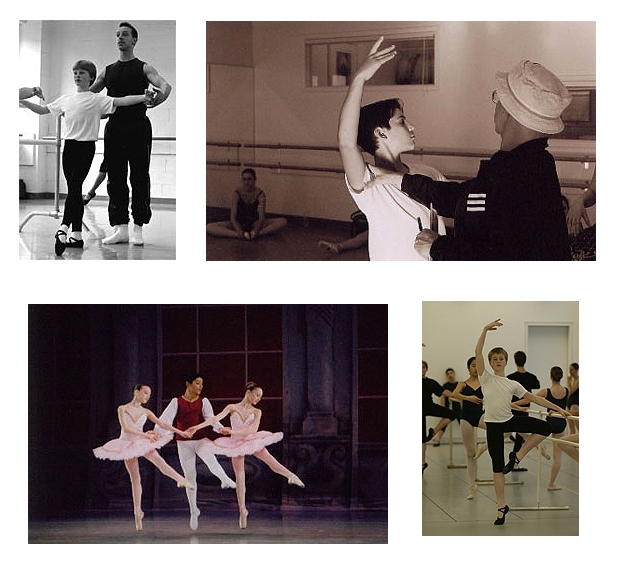 Most ballets have almost equal part male and female roles. But in the U.S., boys who want to do ballet are hard to come by. For that reason boys often receive full scholarships to ballet schools and other forms of special treatment in order to attract them to the profession. Even though the ballet field is flush with women, it’s generally men who become choreographers and artistic directors. This phenomenon, where men quickly rise to the top of female dominated professions, is called the glass escalator. University of Texas at Austin Sociology Chair Christine Williams coined the term and says it’s basically the opposite of the glass ceiling effect. “So, instead of suffering from a wage gap they often receive a wage premium for men even though they’re working in jobs that are predominately female,” said Williams who has been studying gender inequality in the workplace for decades. She says for women in ballet to make it into a top company, they may have to be the best dancer out of hundreds of others. However, as cushy as ballet might sound right now if you’re a guy, Neal says devoting your life to the art form is a double-edged sword. Growing up in a private, all boys school in Virginia, Neal had to deal with a lot of teasing. Whatever the tradeoff, the school’s recruitment efforts seem to be working. 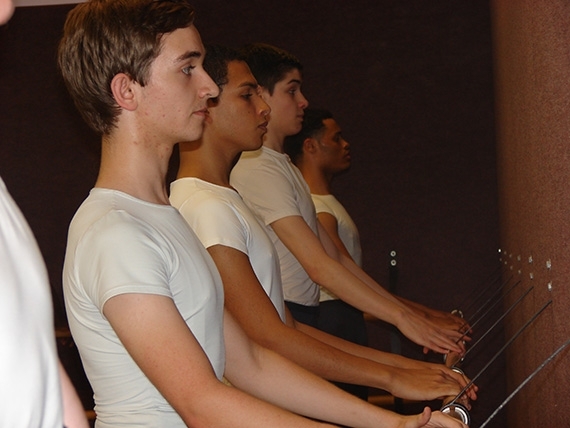 Miami City Ballet School enrolled more boys at the beginning of this season than ever before.